The sudden jump forced traders who had bet against the cryptocurrency to buy back into the market. 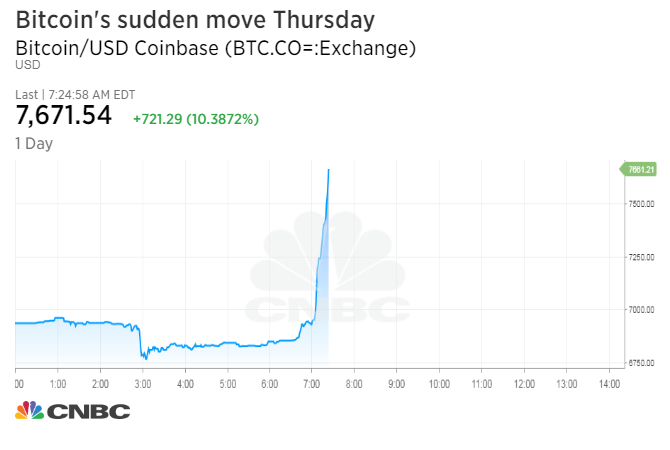 “Once [bitcoin] broke higher, shorts were squeezed and forced to cover,” said Brian Kelly, CNBC contributor and head of BKCM, which runs a digital assets strategy for clients. Bitcoin surged above $19,000 in December, a gain of 2,000 percent over the previous 12 months. But the cryptocurrency has since lost roughly two-thirds of its value given worries about regulatory crackdowns and tax-related selling ahead of the U.S. tax deadline on April 17. Investors who sold or even traded bitcoin last year owe taxes since the IRS views cryptocurrencies as property, meaning transactions are generally taxed. U.S. households likely owe $25 billion in capital gains taxes for their cryptocurrency holdings, according to estimates by Tom Lee, head of research at Fundstrat Global Advisors. Some traders indicated Thursday’s move could be an unwinding of that pressure. “I think it’s just some pent-up market movement,” said Ansel Lindner, a bitcoin investor and host of the “Bitcoin & Markets” podcast. There’s also “some relief in the selling” ahead of tax day. “Even though the price has been going down lately, the development of the next generation bitcoin infrastructure hasn’t stopped,” Lindner said. Once the April 17 tax deadline has passed, some cryptocurrency market watchers expect bitcoin prices can recover further, although regulatory uncertainty remains. “After deteriorating through March, cryptocurrenices are showing early indications of improving,” Rob Sluymer, technical strategist at Fundstrat Global Advisors, said in a Thursday report. Bitcoin “stabilized above $6,500 support over the past two weeks and is rallying through important technical resistance defined by its March downtrend,” he said, noting the next major area of resistance is near $9,000. Other major cryptocurrencies also gained Thursday. Ethereum traded 9.5 percent higher over the last 24 hours near $463, according to Coinbase.